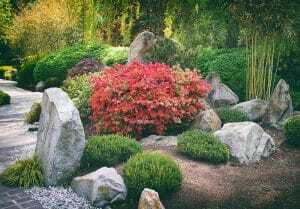 Japanese and Zen gardens have many benefits. From a calming place to retreat from the stress of life to aesthetic beauty to gaze upon. Adding these Japanese elements to your landscape can add to the betterment of your personal environment. A beautiful Japanese garden can promote relaxation and stress relief. 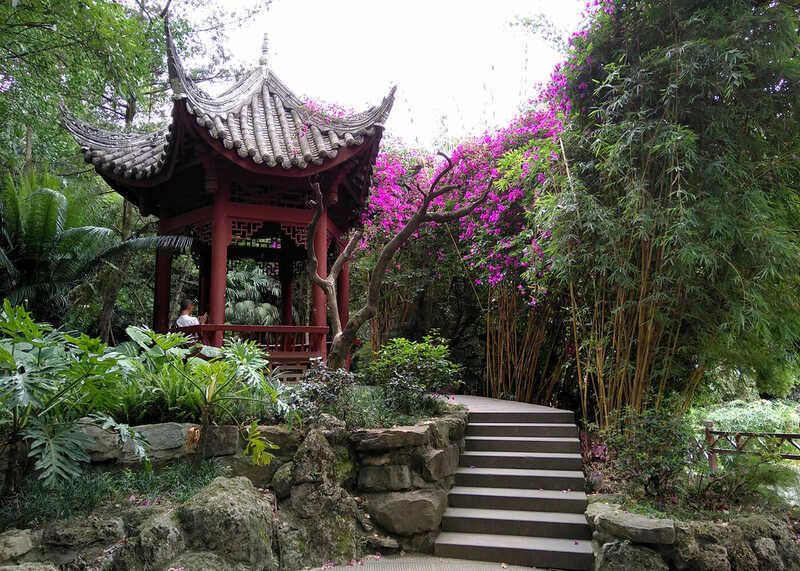 In this study, the mood, aesthetic preference, and heart rate of observers who viewed three different landscape spaces – a tea garden, a French garden, and a few acres of a campus forest – were compared. Thirteen subjects ranging in age from 17 to 52 participated in the study. Mood was assessed using the POMS/Profile of Mood States before and after viewing the spaces. Cardiac output was assessed using a portable fingertip pulse monitor before and during the viewing. It was found that the tea garden evoked greater responses in all outcome measures. The results indicate that exposure to the tea garden had a soothing effect on the mood of the viewers and, after a delay, lowered their pulse rate. Bamboo can be a crucial design element to Japanese Gardens and Zen Gardens. Bamboo as an accent plant or privacy screen can provide a serenity of flora accompanied with a beautiful rustling of leaves. It is the fastest path to add Japanese design to your landscape. The bamboo can be used to create depth and privacy with it contrasting vertical lines and lush foliage. Along with function and form, it can help incite thought and relaxation into your landscape making it the perfect Japanese garden plant. Bamboo is a plant that can easily be contained in specific areas. With the addition of Bamboo Shield, you can define a shape or pattern on the ground in which the bamboo will grow. This aspect can allow you to grow bamboo down to the finest detail and obtain the exact form and composition that you desire from bamboo in a Japanese Garden design. It can easily be incorporated in a rock garden or utilized with rock mulch to compliment traditional Zen gardens. Bamboo is not your typical plant or regular Japanese garden tree. Bamboo is a species of plant that has a multiple of sizes, colors and shapes. Here are the top recommend bamboos for Japanese gardens by category..
Phyllostachys nigra ‘Henon’ – Giant Gray. This bamboo is cold tolerant and can get 4.5″ diameter by 65′ tall. Mature canes have a ghostly pale gray appearance. The contrast of the green foliage on the gray canes makes a striking appearance. Shibataea Lancifolia. This little jewel can get up to 7′ tall but is usually much shorter. It has a long leaf with a velvety underside. This bamboo is also very shade tolerant. Phyllostachys Aureosulcata ‘Spectabilis‘. This is a bamboo that has so many enduring characteristics. It is far from your typical bamboo. The canes are yellow with an alternating green stripe, the leaves have an occasional variegation and about 5-20% of the canes will have a distinct bend in the bottom portion. Phyllostachys Bissetii. This is your normal appearing green bamboo. The aspect that makes this bamboo a winner is its ability to take adverse growing conditions. This is the most durable bamboo available. It can tolerate cold temperate, windy conditions, salt sprays and poor soils.